Our suggestion for the best training to become a certified cave diver is: Our one week package call "Into to Cave Plus". This package gives you four days of instruction, including the cavern and intro to cave courses and two days of experience cave diving at the intro to cave level. note: if you do not complete all requirements in the four days of instruction, we still have two extra days to complete the course (additional instruction costs will apply). That helps take the pressure off, but also the experience dives are very important for a solid understanding of cave diving. Then our second week package called "Full Cave Plus" gives you another four days of instruction and two days of experience diving at the certified cave diver level. The best of the best is to take the above courses with the condos, food and transportation all included, so in that way we take care of all your needs and you can concentrate on cave training. 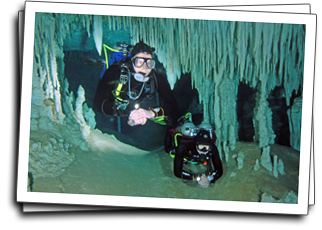 The #1 recommendation for any diver with a sincere interest in cenote diving. This very popular two day specialty course teaches the open water diver the philosophy, techniques, and equipment configuration used for safe cavern diving. 5 cavern dives. The INTRO TO CAVE course is the next step beyond to safely enjoy the overhead environment. 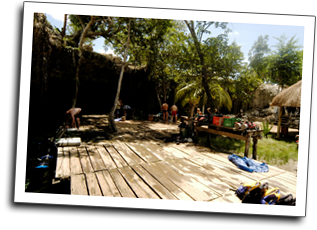 Includes all tanks, air, transportation to the cenotes, refreshments, specialty instruction, one certification fee. Two students or more.....$475.00 each. Cavern and Intro. Courses together plus 2 days of experience dives. NACD. Four-day course completing the cave diving training for INTRO TO CAVE certified divers. 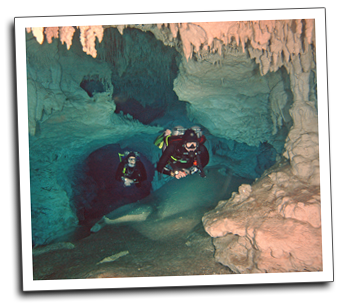 Minimum 8 cave dives involving jumps, gaps, T's, circuit dives, traverses, decompression procedures, restrictions, silty conditions, etc. Includes all tanks, air, specialty equipment, transportation to the cave systems, refreshments, instruction, one certification fee. Two Students ................................ $ 895.00 each. Plus 16% tax. 7 night package with a 4 day course, cavern and intro to cave, plus 2 days of guiding in the caves. All specialty equipment included. FULL CAVE PLUS: 7 night package with a 4 day course, FULL CAVE, (prerequisite intro to cave) plus 2 days of guiding in the caves. All speicality equipment included.